Body Weight Exercises / Raising The Bar on Paperback! Raising The Bar on Paperback! I’m excited to announce that my new book Raising The Bar is now available on paperback! The book release party is still scheduled for June 1, but due to popular demand, Dragon Door has decided to make the book available sooner. They are also offering a discount to anyone who orders the book before the end of the month! 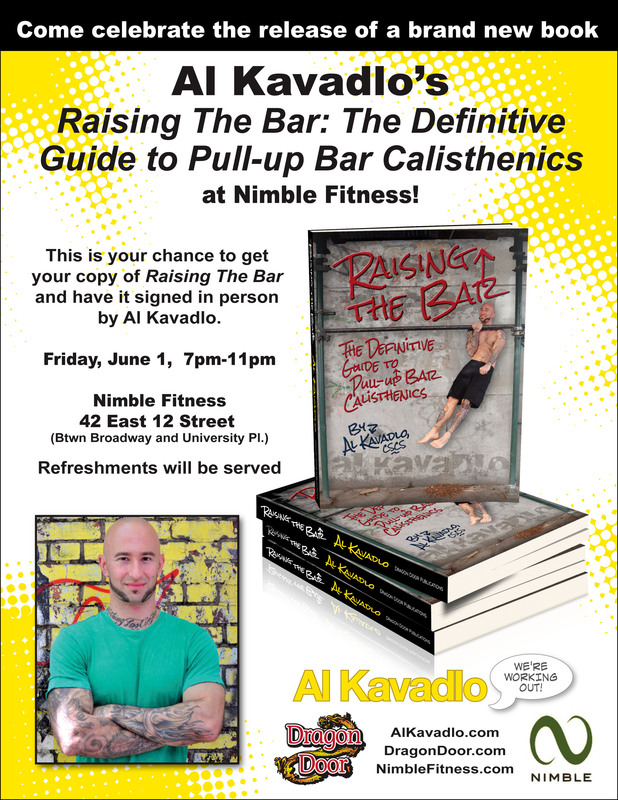 Raising The Bar goes over everything you ever wanted to know about pull-ups, dips, muscle-ups and dozens of other exercises. Click the link for more info on Raising The Bar. If that’s not enough for you, I’ve also got a brand new workout video featuring my brother Danny and me in a calisthenics battle. Check it out and leave your comments below! Really cool, I really envy you have a brother and you train with.By the way, if I stretch, L-sit will be relatively simple? Thanks, Patrick! Even if you are flexible, you still need to be strong to do an L sit. And yes, it’s fine to rest when you are sore. Love it! Thank you for these great videos that are kid-friendly, funny, encouraging, and super cool. Amazing video Al, very inspiring indeed. And congratulations on the book release. I am going to grab a copy for sure. Thanks, Dave! Can’t wait for you to read it! Awesome video. I am definitely going to grab a copy of your book. How long should i rest in between sets? And will a purely calisthenics workout suffice for MMA? Thanks, Kiran! If you’re training for strength, rest as long as you need to between sets. If you’re training for endurance/conditioning keep your breaks shorter. And yes, I believe bodyweight training is totally sufficient for MMA athletes. Great vid, you nd ur bro are the inspiration as to why I’ve started doing more calisthenics and less weights. Thanks, Vlad! Glad to have inspired you! Great Video. Got your ebook which has helped me to do more bar work. I am really impressed with you and brothers fitness level. Hopefully you will come out with a push up book. What is the push up book? Will that cover all sorts of push ups? Yes, but it won’t be available til next year. I cannot provide any more info on it at this point. heard the quote ‘just an analogue guy in a digital world’ spot on for you and your training no more joint pain for me and i cope better with what ever army life throws at me thanks matt. Thanks! Though I am typing this on my laptop, so I’m not analogue about everything! I ordered your book last Thursday. I can’t wait for it. I’m totally ready to dedicate myself to bodyweight exercise. Thank you for sharing your knowledge and videos!! Thanks! Can’t wait for you to read the book! I find your methods and philosophy very motivating, I hope that this website would help me in my journey for increased functional strength and fat loss; a quick question: Would calisthenics help with fat loss on their own or is proper nutrition a must for burning fat? Thanks! Calisthenics can help with fat loss but if you want to get lean and muscular, nutrition is also essential. I’m glad I ran into your blog, it has awoken in me a curiousity and drive to work on bodyweight training. I’ve always been working out in the gym on machines. Then 2 years ago, I got sick of it and started (free) weight training, which I found to be as an improvement already! Now I want to take it to the next level! Thanks for the motiviation and advice! Thanks for the comment! Welcome to the world of bodyweight strength training! 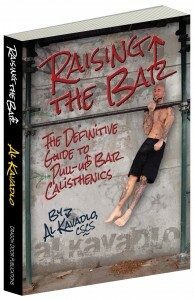 Just got my hardcopy of Raising The Bar and it is another fine book, like A Zen Approach to Working Out. Both are very well written, cut to the point, and avoid unnecessary dude-broham talk that plagues other blogs. Between your 2 books and Convict Conditioning, I feel like I have a better understanding of how to tailor my fitness journey. Looking forward to learning pistols and hanging leg raises. Thanks for the comment, Tushar! Glad you’ve enjoyed my books – keep training hard! congratulations on a wonderful achievement. will definitely be picking up a copy of this, particularly because our new app is all about working out. all the best to you. Thanks! Hope this isn’t just spam! Hi Al, I’m anxiously waiting for your book to arrive in Holland. I hope it will be possible some day to have you as my personal trainer in the mythical Tompkins Square Park during my visit in New York, when I happen to be there again. Maybe you can teach this old dog some new tricks! Hey Zeger – Definitely get in touch if you make it out to NYC and want to get a session in. In the meantime, hope you enjoy the book! Love the video Al. The dynamic switching between different types of pushups is great! The plyo pushups onto the knuckles Danny does looks brutal. Has the ground in that park got any give to it, or is it solid concrete? The forward roll on the parallel bars into a dip was also freakin cool! Makes me wonder what other tumbling drills are possible on the bars. Thanks, Rob! The ground on that basketball court is solid concrete and very unforgiving. Btw, I’ll work on that 180 spin push-up. Maybe you’ll see it in one of my videos eventually. That video is awesome!!! What strength and stability you both have! The muscle ups, then the levers, then the flagpoles, then on each other, wow! Play at the playground much, lol! Keep it up, you inspire us all! Hey Al! Just needed some quick advice: What are your thoughts on sprinting and its pros and cons plus general effects on your body? Would you recommend it for weight loss? Thanks! As for sprinting, I might do a post on the topic at some point. It’s definitely worth exploring but there is too much to say on the matter to fit it all into this comment. Thanks for the link Al! I am pretty sure that was what I really wanted to see albeit unconsciously, yes, and I would definitely look forward to the sprinting post. Again, thanks for pausing to consider! Guys, thanks for making a print version of your book. I have nothing against e-books and PDFs, but I read and comprehend a lot better with a hardcopy. The video confirmed what I suspected all along – you guys are total hams in front of the camera, but more importantly, you’ve got the kind of strength and agility I want to have. Really looking forward to getting the book! Thanks! I prefer real books over ebooks as well – hope you enjoy reading it! I was reading your book again last night and I smiled after I saw the lady picking up after her dog in the background as you are doing a negative pull up sequence on pages 12 & 13. Great book.